As a first time canner, I began with the sugar formula (as I respectfully call it, because, really, that's all it is). Basically, boil up equal parts fruit to equal parts sugar until it reaches 220 degrees, tidy it up in a pretty jar, and give it a hot bath. Yellow, orange, and maroon wild picked Salmonberries were the guinea pigs; it was candy, and has nearly been gobbled up by yours truly smashing it between two discs of my latest baking obsession, lavender shortbread. I learned to be very mindful of the temperature as this batch was on the sticky side. Next up was Raspberry. For the sugar formula, using handpicked raspberries from a friend's yard, it was perfect. But eat it every day on toast and you might go into sugar shock. SO, once the bounty on the homestead started to come in, and feeling comfortable enough with the sugar formula to move on, I began to experiment. I mixed, I jumbled, I switched up the sweets, I added a bit of tart here, a load of savory there, a sliver of herb, a touch of spice. And holy deliciousness. Farm to table has never tasted so good. Honey Plum Jam with Vanilla Bean (left), Lavender Peach Compote with Blackberries (middle), Strawberry Rhubarb Rose (right), Savory Blueberry Chutney, Strawberry Balsamic Compote...I salivate each morning (let's be honest, all day) just knowing they are in my pantry. Ice cream has new life, as does a humble turkey sandwich, or a wedge of soft cow's milk cheese. The morning toast ? Hubby can have it. I'll have a thick Greek yogurt parfait with lavender granola and heaping spoonful of Lavender Peach Compote. And then, equipped with all that sugar fueled energy, I'll can some more. Like today. What did I do with the garden's haul of 5 pounds of pretty purple Italian plums? Chutney baby. Here's the recipe. I'm thinking pork chops, a sit in for tired cranberry sauce at the Thanksgiving table, roasted duck breast, and, always reliably, cheese. Most of you don't have 5 pounds of plums laying around - but I'll betcha the farmer's market does. Or switch it up and use pears... or blueberries... or whatever little sweetness overfloweth at your neighborhood farm stand. 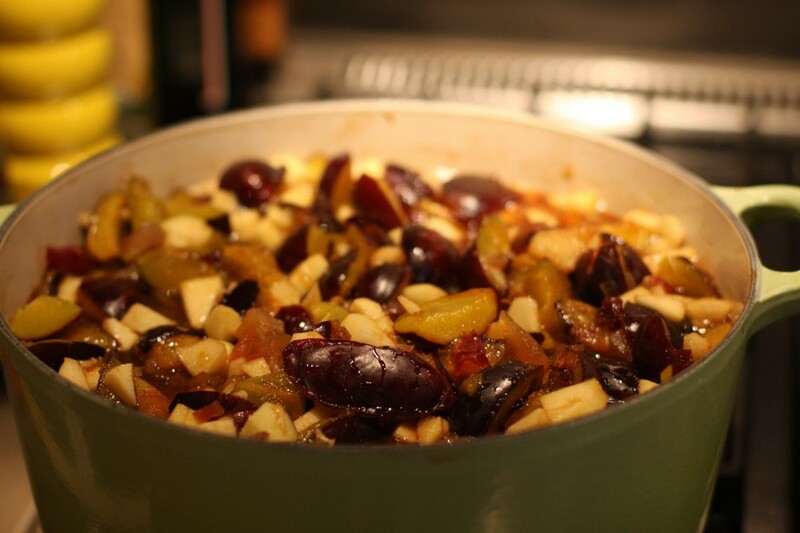 *Italian plums are beautiful when cooked with. Unlike most plums, they are less juicy, which lends them to hold their shape better when heated. You can try this with other plums but expect the chutney to fall apart more quickly. Prepare plums, apples, and cherries, and set aside. Bring the onions, garlic, ginger, vinegar, sugar, seasonings, and spice bag to a boil. Simmer gently for 10 minutes until contents are dissolved. Add the plum, apple, and cherry mixture and return to a boil. Cook gently until the plums are nearly fully broken down, about 2 hours. The sauce, when run through with a wooden spoon, should part and expose the bottom of the pan briefly when done. Ladle the chutney into sterilized jars, leaving 1/2 inch headspace. Seal tightly and refrigerate for up to 3 weeks, or process in a water bath to preserve in the pantry for up to 1 year. I'd let the chutney season for at least a few weeks before indulging - it gets better with age. Wipe the rims clean of any debris to ensure a proper seal. Simmer lids in boiling water for a few minutes to soften the rubber flange. Remove, and place lids on jars. Screw on bands only fingertip tight (this is so the steam can release during the canning process but nothing can get inside). Process using a water bath canner for 10 minutes. Remove, and allow to cool on the counter. Store somewhere cool and dark for up to one year. Refrigerate after opening.